If you are starting a new business, it is important to understand everything you need to do and how to operate, especially in an industry like roofing supplies, not the least as you will have to carry large stocks of many expensive products. 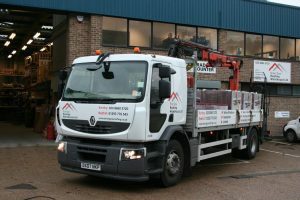 Because of this, despite being extremely competent and experienced, when Vince Elgar started up in Redhill in 2001 he made doubly sure of viability by going into business with Brian Gow; Brian had been a director of a major roofing company who had recently been bought by an even larger international group. Brian was a very established figure in the industry. Nevertheless it did not become limited until 2004 and in 2008 Vince bought out all the shares to become the sole owner. He immediately opened a second large location in Kenley, just south of Croydon. They knew they needed a computer that would handle multi-locations and give the management instant information and control over all aspects of sales, purchasing, stock and customer relationships. They installed a 10 user Sharp-aX System from Sharp-aX Computer Systems in Berkhamsted which is SQL Windows based, very modern and feature rich and future proof. Interestingly, the system is hosted for them by Intelligent Performance, who are both competent and co-operative, so that Brian Gow Roofing are not involved in server management at all.